« Clonmult/Dungourney News. 6. 1. 2019. Clonmult/Dungourney News. 13. 1. 2019. Masses during the week. Monday to Friday 9.30 am. Last Weekend’s Collection. Door €271.63. Diocesan €220.00. Thank you. The Faithful Departed. Anniversaries, Margaret O’Riordan. May she rest in peace. Diocesan Directory. Copies of the Diocesan Directory are available at the back of the church. Price €3.00. No’s Drawn. 7. 12. 20. Clonmult Ambush Commemoration Committee. 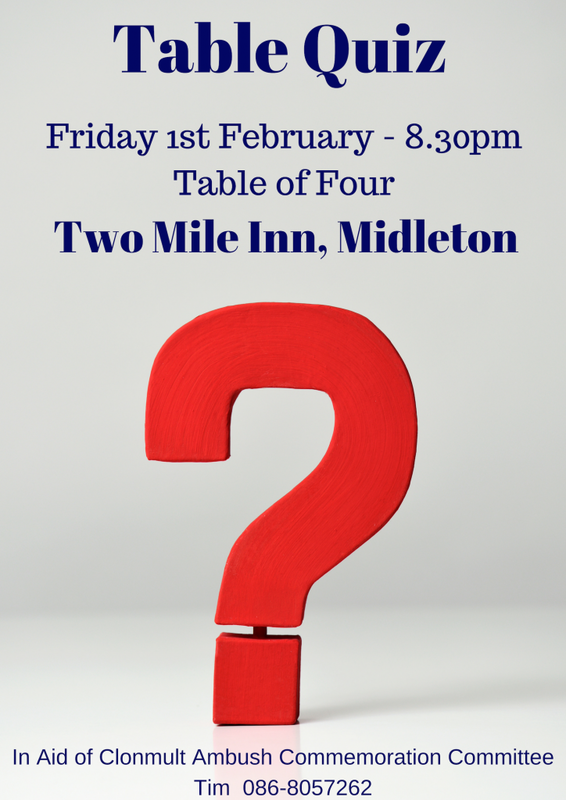 Our Annual “Table Quiz” takes place at the “Two Mile Inn” on Friday 1st, Feb @ 8.30 pm. Teams of “Four” 40 Euro per Team. Numerous spot prizes. Ambush Commemoration. The Annual Ambush Commemoration will take place on Sunday 17th February. Mass in St. Laurence’s Church Clonmult at 11.00 am., followed by Prayers and Oration at the Ambush Site. The Oration will be given by former Fine Gael Leader Alan Dukes.